$9.95 In stock. Order in the next 6 hours, 6 minutes and it will go out today! In stock. Order in the next 6 hours, 6 minutes and it will go out today! We pop off our February line-up with the KING of buskers, Gazzo. He's here all the way from the UK to teach you his latest busking set that the magic world has been buzzing about. You'll also see live footage of his performance at the Magic Castle. Hosted by Chris Oberle, we'll get to understand the ins and outs of a busker's life, including one-liners, how to handle a crowd and some hilarious routines like his Black Bag trick, which is sure to fool and delight. Approach - Have you ever been nervous approaching spectators? Gazzo gives great advice to make you more comfortable approaching laymen. No one knows how to break the ice better. How to Get Started - Gazzo has performed on the street more than any magician around. He will give you some great tips and advice on how to get started busking on the streets. Misdirection - We all know that misdirection is key while performing. Gazzo has a very clever way to misdirect laymen while performing your magic. 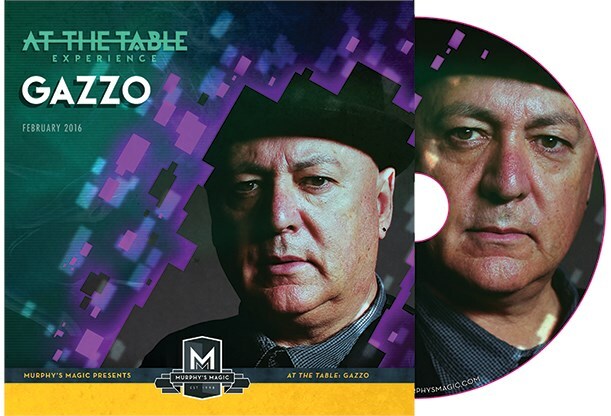 Live at the Magic Castle - Many people have raved about Gazzo's 2015 performance at the Magic Castle. Get a first look at what everyone is talking about. His hilarious one-liners, gags and effects will have you wanting to learn more. Black Bag (Egg Bag) - This is the trick that was most talked about at the Magic Castle. A bag is shown to be empty and a spectator reaches inside but feels nothing. Hands are shown to be completely clean as the magician reaches inside and pulls out not one but SEVERAL eggs! Gazzo gives great advice on how to perfect this routine, plus how to make your own eggs to use with the egg bag, along with some hilarious gags that will have the whole audience on their knees in laughter. The Pitch - Every street performer has a pitch. It's at the heart of how they make money. Gazzo talks about what it takes to have a great pitch and how to make your audience feel comfortable with throwing money into your hat. Card Peek - This is a clever way to glance at the top card that will fool magicians and laymen alike.